Below is an excerpt from the Vault doc. 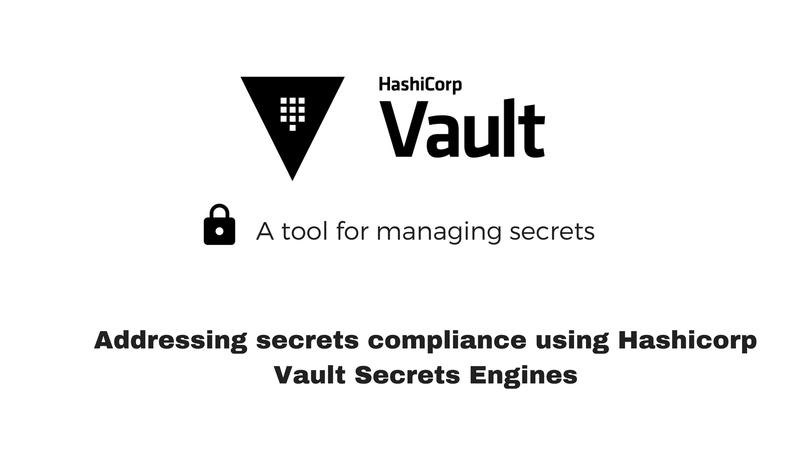 Vault Secrets Engines are the components which store, generate or encrypt data. Some secrets engines simply store and read data – like encrypted Redis/Memcached. Other secrets engines connect to other services and generate dynamic credentials on demand. 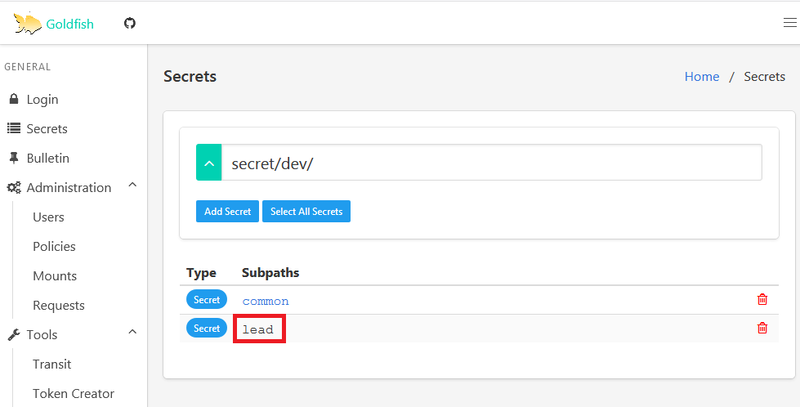 Secrets engines are enabled at a “path” in Vault. When a request comes to Vault, the router automatically routes anything with the route prefix to the secrets engine. In this way, each secrets engine defines its own paths and properties. One of the case we need to address as part of the scenario we discussed in the previous part is to retrieve the secrets dynamically. The AWS and Database secrets engines generate dynamic credentials on demand. We can make use of this to get AWS API Keys and Database passwords dynamically rather than storing a static API Key or password in a file. In order to configure vault using CLI, first we need to authenticate with the vault server. There are various authentication backends with which we can authenticate with vault. We will discuss those later. For now, we can authenticate using our root id which we received during the unseal process. Login to both the vault nodes and run the below command. Vault can be configured using CLI and HTTP API. In this article, we will predominantly use CLI and use HTTP API whenever there is a need. While using CLI, following steps can be performed in any of the vault node ( vault-a or vault-b ) since the stand-by node will automatically forward the commands to active node. It is assumed that you have authenticated using your root token in the vault server. While using HTTP API, we need to pass the token that has the privilege to perform the operation. For eg, we will use the root token assigned using the environment variable $VAULT_TOKEN while executing the curl command. This engine will generate AWS access credentials dynamically based on IAM policies. The AWS IAM credentials are time-based and are automatically revoked when the Vault lease expires. We need to enable the AWS secret engine before we can use it. The other secret backends are enabled by default. Next we need to configure vault to communicate with our AWS account to generate the IAM credentials. You can provide the access and secret key of the IAM user which has enough privilege to generate the IAM credentials. Providing AWS root credential is not recommended. You can also specify the credentials via the standard AWS environment credentials, shared file credentials or IAM role/ECS task credentials. The next step is to create a role that maps a name in Vault to a policy or policy file in AWS. When users generate credentials, they are generated against the corresponding role. For this example, we can create two roles. Create a file named my-bucket-full-policy.json with the below content. The lease_duration indicates how long this credential is valid. This value can be tuned based on your need. Realistically, communication with Vault mostly takes place through the API. 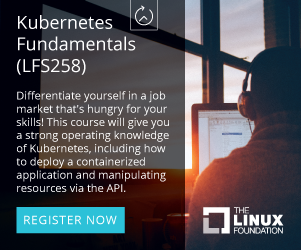 Applications and clients connect to Vault through API’s to fetch credentials unlike the step we performed using CLI. The below commands can be executed from any node that has access to the vault server. First, let’s assign the token which has the necessary access to a variable. Execute the curl command against the endpoint that generates the credential. By default Vault will automatically revoke this credential after 768 hours ( lease_duration ). We can also revoke the secret manually if needed. Once the secret is revoked, the access keys are no longer valid. The database secrets engine similar to aws secrets engine, generates database credentials dynamically based on configured roles. It works with a number of different databases through a plugin interface. 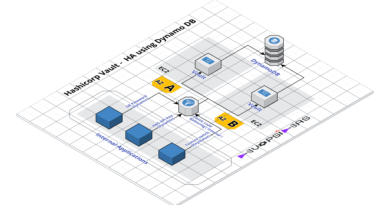 Vault supports multiple Database backends such as Cassandra, MongoDB, MySQL, MariaDB, PostgreSQL etc. In this example, we will see how we can configure MySQL backend. We are creating a database configuration with the name app1-database assuming we are configuring this for an application named app1. In the connection url, you need to pass the connection details such as the id with which vault will connect to the database and the database host. We also pre-assign two roles which we will create in the next step. Configure a role that maps a name in Vault to an SQL statement to execute to create the database credential. For this example we will create two roles app1-read and app1-write. The app1-read role will have READ access to app1 database and app1-write role will have write access to the app1 database. Make sure you pass the correct db_name. The name of the database config we created in the previous step was app1-database. creation_statements is where you can provide the relevant access for the role. 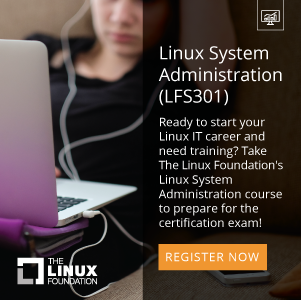 default_ttl of 1h indicates this credential is valid for 1 hour. This can be renewed if needed but it cannot exceed 24 hours which is defined by the max_ttl. After 24h, the credential has to be rotated. Generate a new credential by reading from the /creds endpoint with the name of the role. The kv secrets engine is used to store arbitrary secrets unlike the other two engines we discussed above. Writing to a key in the kv backend will replace the old value. Key names must always be strings. If you write non-string values directly via the CLI, they will be converted into strings. However, you can preserve non-string values by writing the key/value pairs to Vault from a JSON file or using the HTTP API. For this example, let us consider we have two teams. Dev and QA. These two teams need to share passwords within themselves. Also the Lead of each team has additional passwords which none of their team members can see. First let us add some secrets to simulate this scenario. Later using LDAP backend, we can see how we can apply the ACL to enforce restriction. We are storing the secret for Dev Lead at secret/dev/lead. In the previous examples, we have used root token id to authenticate to retrieve the secrets from vault. But this will not be the case in real time and this is just to get you started with understanding how dynamic secrets work. We will see how we can make users and application fetch these credentials when we discuss about auth methods. Policies provide a declarative way to grant or forbid access to certain paths and operations in Vault. Policies in Vault control what a user can access.. We will be mapping these policies with the auth methods we will create in the next section. In the AWS Secrets Engine, we created two roles. my-bucket-full and ec2-read. We can provide policies that provide read access to these roles and attach it as part of the auth methods we will create later. Create a file named policy-my-bucket-full.hcl and copy the below content. Policies are authored in HCL(Hashicorp Configuration Language), but it is JSON compatible. Create a file named policy-ec2-read.hcl and copy the below content. We have created two roles for Database Secrets Engine, app1-read and app1-write. We can create policies for the same. Create a file name policy-app1-read.hcl with the below content. We have stored four secrets as part of kv. Out of four, the ones under /secret/dev/common and /secret/qa/common are share between teams. Other should be accessible only by the corresponding team leads. First lets create policies which provide access to teams in common. Create a file named policy-dev-common.hcl with the below content. Create a file named policy-qa-common.hcl with the below content. For leads, we need to provide all access for the respective paths. Create a file named policy-dev-lead.hcl with the below content. For QA lead, create a file named policy-qa-lead.hcl with the below content. Authentication in Vault is the process by which user or machine supplied information is verified against an internal or external system. Vault supports multiple auth methods including GitHub, LDAP, AppRole, and more. Each auth method has a specific use case. Before a client can interact with Vault, it must authenticate against an auth method. Upon authentication, a token is generated. This token is conceptually similar to a session ID on a website. The token may have attached policy, which is mapped at authentication time. The approle auth method allows machines or apps to authenticate with Vault-defined roles. This auth method is oriented to automated workflows (machines and services), and is less useful for human operators. AppRole auth method was specifically designed to be used by machines or applications to login to Vault. The AppRole auth method allows multiple “roles” to be defined corresponding to different applications, each with different levels of access. To authenticate with Vault the application is assigned a static Role ID and a dynamically generated Secret ID which are both required to login and fetch a Vault token. We have already created policies that provide relevant access to roles. We will be using these policies while created roles in Approle. The two policies that we will make use of for the above case is, policy-my-bucket-full and policy-app1-read. Note: In a more restricted environment, the secret_id and role_id might be generated using intermediate hops (dedicated services like CM tools ) individually and will not be able to fetch vault tokens themselves. The App will then use the bootstrapped credentials. Case1: Script requiring access for S3 bucket. Applications can be written to dynamically fetch credentials from vault. You can take a look at sample Vault-aware application to get an idea. For this example, we assume that application will make use of environment variable for accessing the database. The above script can be made to run in cron based on the ttl of the credential retrieved. The application can use the env variable DB_USERNAME and DB_PASSWORD to access the database. With this we have addressed the requirement to generate dynamic secrets, secrets rotation and revocation. The ldap auth method allows authentication using an existing LDAP server and user/password credentials. This allows Vault to be integrated into environments using LDAP without duplicating the user/pass configuration in multiple places. 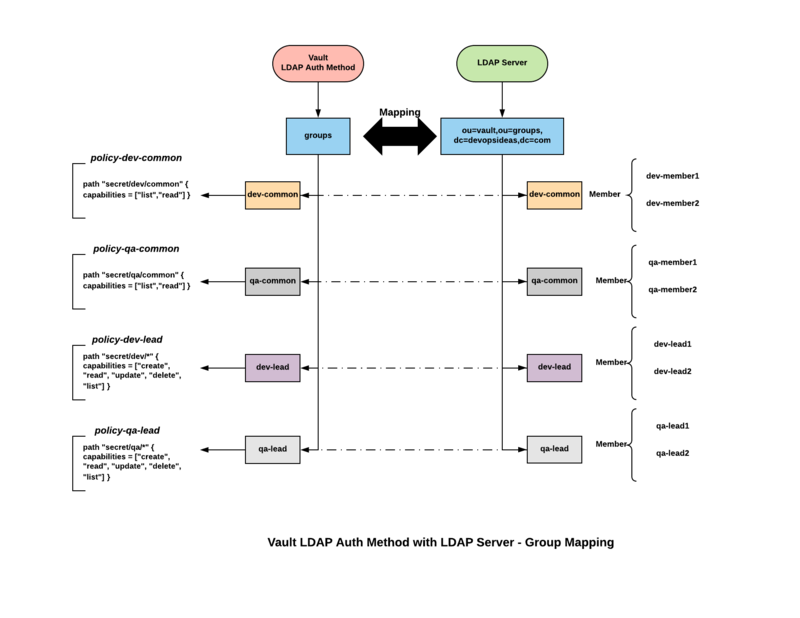 The mapping of groups and users in LDAP to Vault policies is managed by using the users/ and groups/ paths. While discussing kv secrets engine, we discussed a scenario about sharing secrets within dev and qa team. The above diagram depicts the architecture for the same. 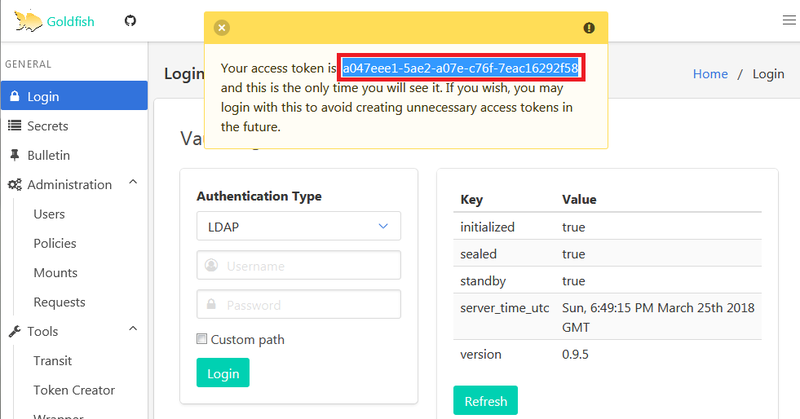 We need to make sure the name of the group created as part of LDAP auth method is identical to the group name in LDAP server. Also we are assuming the groups in LDAP server are within ou=vault,ou=groups,dc=devopsideas,dc=com. Create groups with identical name in the LDAP server and add members to it. If you are new to LDAP, you can go through this complete tutorial about implementing openldap with realtime use case. 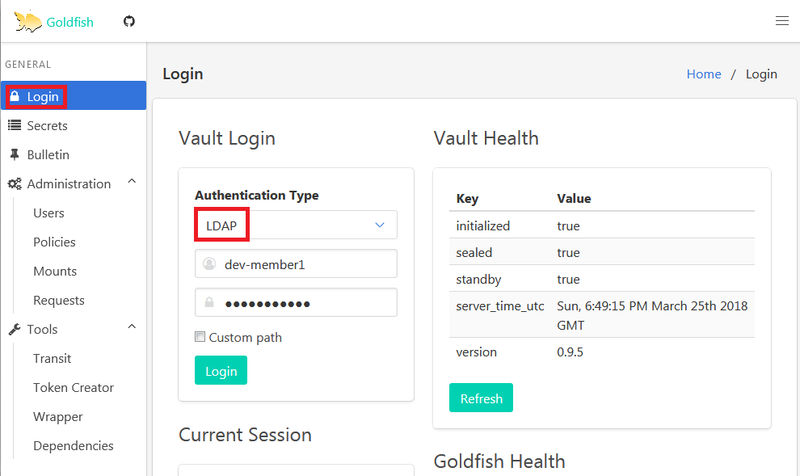 Assuming that we have created groups and added members in the LDAP server, next we can install goldfish which is an UI for vault. Unlike other auth methods, LDAP auth method will most probably used by users and hence providing them with an UI to retrieve and update secrets will become necessary. Vault Enterprise comes up with inbuilt UI. If you are opting for the opensource version, you can make use of multiple UI’s available for vault. We will be using Goldfish which is an opensource vault UI. You can refer Goldfish Production Deployment for steps on how to install and configure it. Make sure you install goldfish executable in all vault nodes. Recommended configuration is to make goldfish run in port 8000 and use nginx as revrese proxy. You can refer Nginx Reverse Proxy for this. Once you setup Goldfish, Click login and select authentication type as LDAP and enter your LDAP credentials. In this case dev-member1 will be part of dev-common group. If the credential is correct and the id is part of an authroized group, you’ll retrieve a token. Next select Token from Authenticaton Type dropdown and paste the token received in the previous step. You’ll be logged in successfully. Click on Secrets and you’ll see the list of available paths and secret. Navigate through dev and try clicking on lead. You’ll get permission denied message. This is becase dev-member1 is not part of dev-lead group. Navigate to common and you’ll be able to see the credential that is common for dev team. With this we have verified the ACL for dev-common. Similarly we can repeat the steps to verify other ids. Audit devices are the components in Vault that keep a detailed log of all requests and response to Vault. Because every operation with Vault is an API request/response, the audit log contains everyinteraction with Vault, including errors. When a Vault server is first initialized, no auditing is enabled. Audit devices must be enabled by a root user. Important: If you have only one audit device enabled, and it is blocking (network block, etc. ), then Vault will be unresponsive. Vault will not complete any requests until the audit device can write. With this we have addressed all the requirements specified in the scenario. Feel free to provide your feedback/suggestions in the comments section.